The first thing that any visitor to Keith Harris' office is struck by is the plethora of Manchester United memorabilia plastered on the walls. Signed pictures of legends such as David Beckham surround Mr Harris, renowned as one of English football's premier deal makers. The eagle-eyed visitor may also notice some Aston Villa items, where he helped engineer the buy-out that took Randy Lerner into power at Villa Park. Mr Harris, the chairman of UK investment bank Seymour Pierce, has also worked behind the scenes in buy-outs at Manchester City and West Ham United. However, his latest move is much more personal - spearheading a potential takeover of Manchester United, at the head of what is being dubbed the Red Knights group of financiers. He has in recent months been backing the green-and-gold campaign of Manchester United fans disgruntled at the business plan of the club's owners, the Glazers. 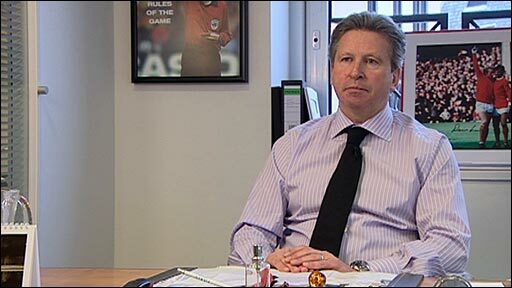 But now Mr Harris has gone on the offensive, meeting with other financiers to discuss how they can launch their own bid for the club. To many though, the timing may seem rather strange. The club had a successful bond issue in January, raising £504m investment, which will cover most of the £509m the club owes to international banks. Unlike that bank debt, the bonds do not have to be paid off until 2017. That is the same year when punishing Payment in Kind (PIK) loans from hedge funds - for which the Glazers are responsible - are due to be paid. Those PIKs have a stringent 14.25% interest rate, and by converting their bank debts into bonds, the Glazers are now free to start repaying the PIK loans. So, to a certain extent the financial situation at the club has been stabilised. Also, if anyone wants to buy the club they are going to have to pay somewhat more than the £800m the Glazers paid back in 2005. Some analysts say a figure of £1.6bn may be nearer the asking price, and if the club's £700m debt is added the total could come to more than £2bn. "That is an awful lot of money to find," says Harry Philp, managing director at sports financers and advisors Hermes Sports Partners. "The value that the Glazers' put on the club is going to be massive. This Red Knights group are going to have to round up some very wealthy people if they are looking at an all-equity deal." The other way to take over the club would be to leave some debt in place, but, given that this is what the anti-Glazer camp has been campaigning against, such a move would not play well with fans. For now the Red Knights group is not giving any details of how it would make its move. "We can confirm that a group of high net worth individuals, who support Manchester United [known as the "Red Knights"], met in London yesterday," the group said in a statement. 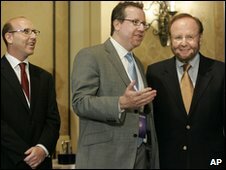 "This group is supportive of current management, but are looking at the feasibility of putting together a proposal to be put to the Glazer family regarding the ownership of Manchester United. "These discussions are in early stages and no contact has been made with the Glazer family." The group says it hopes to involve Manchester United fans worldwide should it end up running the club. "Any new ownership model would aim not only to put the club on a sound financial footing, but would also aim to put the supporters at the heart of everything the club does." In the coming weeks the Red Knights said they would work with the Manchester United Supporters Trust "to formulate our proposal". The timing of the group's announcement is interesting. The Manchester United brand has been successful again on the field of play, winning the League Cup against Aston Villa on Sunday. 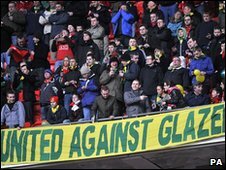 But more interestingly, Mr Harris and his group will have seen the widespread support for the green-and-gold supporters' group, with their bright scarves much in evidence at Wembley. And they may also have noted that in the latest Deloitte list of the world's richest 20 football clubs, released today, United have slipped to third place behind Real Madrid and Barcelona. However, as far as the Glazers are concerned such issues are academic. "The club is not for sale," their spokesman told the BBC. But the coming months will tell whether Mr Harris, a Manchester United fanatic, is to be so easily dissuaded.